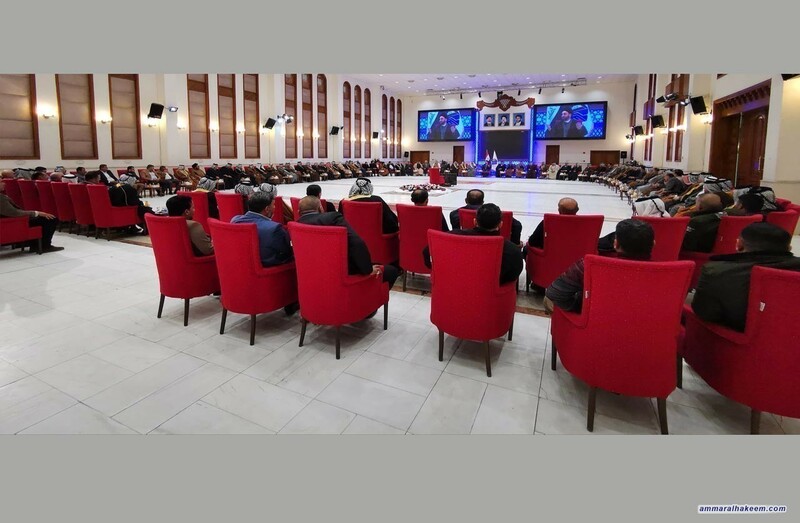 Head of the Reform and Reconstruction Alliance, Sayyid Ammar al-Hakim, in his office in Baghdad received a group of Iraqi tribal princes, sheikhs Sunday 13/1/2019. His eminence discussed latest developments in the political situation, recalling the honorable past and modern history of the Iraqi tribes, their outstanding efforts in fighting Daesh and responding to the call of the religious authority. His eminence highlighted the active role of tribes in achieving civil peace and social harmony, called for more social contributions to support security stability and social harmony. His eminence emphasized on winning services, job provision and the fight against corruption challenges, to be added to the victories achieved on political, social and military levels, called for all sides to unite in order to achieve this victory, including the tribal establishment. The tribal delegation praised the efforts of Sayyid Ammar al-Hakim in convergence of views among political parties and in supporting the prime minister to appoint those he deems appropriate for the government, plus unitary speech and advocating for unity.